The Burmese army is forcibly recruiting children to cover gaps left by a lack of adult recruits, says a report by a US-based human rights organisation. Human Rights Watch (HRW) says children as young as 10 are beaten or threatened with arrest to make them enlist. Both the army and ethnic rebels have been accused of using children before. But the timing of this report is particularly damaging for the military, which is already under pressure after a crackdown on anti-government protests. The military insists it is opposed to the use of child soldiers, but HRW says the abuses were extensive and systemic. It said it had published the report to try to urge the United Nations Security Council to tackle the issue. The report, entitled "Sold to be Soldiers: The Recruitment and Use of Child Soldiers in Burma" says there are thousands of children in the Burmese military. It claims that children are approached in public places by military recruiters and civilian brokers who have been promised cash rewards by the military. The children are often beaten or threatened with arrest to force them to enlist, the report says. It is claimed that recruiting officers routinely falsify enlistment documents to register children as being 18, the legal minimum age for recruitment. One child quoted in the report says he was forced to lie about his age when he was recruited for a second time. "I just wanted to go back and home and I told them, but they refused." The child recruits are deployed to battalions after an average of 18 weeks training, the report says. They are often reportedly sent into combat immediately, or forced to take part in activities, such as burning villages, which can be classified as human rights abuses. 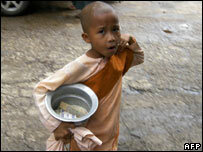 Jo Becker, children's rights advocate for HRW, said Burma is "literally buying and selling children" to fill the ranks. "The government's senior generals tolerate the blatant recruitment of children and fail to punish perpetrators," she said. "In this environment, army recruiters traffic children at will." Ms Becker said that the recent military crackdown had put off many of those potential recruits who were not already deterred by poor conditions and low pay. "After deploying its soldiers against Buddhist monks and other peaceful demonstrators, the government may find it even harder to find willing volunteers," she said. 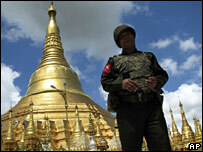 The Burmese ruling junta says it has formed a high-level committee to address the issue of child soldiers. However, Ms Becker described the committee as "a sham", saying the government must address the issue head-on and demobilise all children. The UN Security Council is due to meet soon to discuss the use of child soldiers in Burma. HRW has accused the Security Council of not taking any action to address the issue, despite stating repeatedly that it would consider targeted sanctions. The group has urged the UN to impose travel restrictions and arms embargos if the situation does not improve.